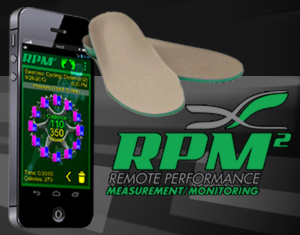 RPM² boasts innovative and proprietary technology that helps athlete and coaches around the world monitor performance and measure power output. Since our products have revolutionized wearable technology in sports, many people have questions about how our products work along with queries regarding their usage. Following are a few of the most commonly asked questions about RPM² footbeds. How long does it take to charge my footbeds? When a customer orders RPM², the system comes with a charging mat that plugs into a wall socket. Each insole takes about 60 minutes to become fully charged. How do I clean my footbeds? RPM² footbeds are not waterproof so they should never be submerged in water. To clean your footbeds, we recommend using a slightly damp, clean cloth with alcohol or a mild soap with a disinfectant. Allow your footbeds to air-dry after cleanings. How long will the charge on footbeds last? Fully charged footbeds can last up to six hours at high energy outputs such as when a person is cycling or running. When in idle mode, the charged footbeds can last about 30 hours. Can I use the data with Training Peaks? Yes. You can have your RPM² data loaded into Training Peaks by using the drop down window on the official RPM² apps for iOS and Android. Is RPM² compatible with ANT+? RPM² is compatible with ANT+. For more information on how to use ANT+ with your data, we recommend looking at our helpful guides, which can be downloaded free for Android users and iOS users. What happens when RPM² requires updating? Like other app-based technology, updates are important for keeping our customers engaged with the latest developments and features of our remote performance monitoring systems. All software updates are free to download on your device’s app store. Updates that affect firmware are sent to our customers wirelessly, free of charge. For more information, browse our official website or use the search bar function on our blog. You can also ask questions and interact with our team on social media.